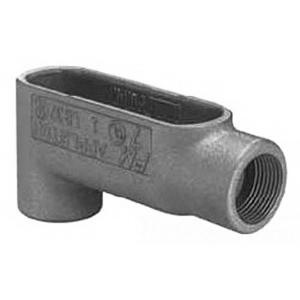 Appleton OZ Gedney Type LB conduit body of trade size 1-Inch, is suitable for use with rigid conduit and IMC. It features malleable iron construction with hot-dip galvanized finish for longer endurance. Conduit body with threaded connection, has 12.5-Cubic-Inch capacity and accommodates three conductors of size 4-AWG. This back access conduit body has two hubs placed at 90-degree. It measures 14.56-Inch x 4.98-Inch x 6.6-Inch. Conduit body is UL listed and CSA certified.